Arch Red Guest Server version 2.8.0 is now available. The version number jump from 2.6.x is an indication of a substantial change: the guest server now handles the time in UTC (Coordinated Universal Time). The user interface stays the same, but the users are now associated with a time zone. This change helps organisations that operate on multiple time zones. For example, the user can be located in Finland while the Guest Server runs in the headquarters in Australia's Adelaide *. The user associated time zones add to the Guest Server's existing support for internationalization and localization. Global organisations can better serve their customers internally and those who want to run guest sever as a service can now offer their service word wide. Other changes include enhanced support for multiple languages and easier Guest Server installation. Also included is the previously blogged support for duration for all guest account types. Publications have now been added in English and in Finnish. We usually try to keep the content on our web pages similar, but this time please see the both. For example, the comprehensive IPv6 and NAT material is only in Finnish. The topics include papers, tutorials, white papers and reports on WLANs, user authentication, roaming and other networking issues. This is a good start and more will be available later. Product summaries page comes from the experience gathered from the presentations and courses we have given. There is always the moment when the topics are put together, so why not look at the products as a whole too? We already had the products listed individually, and now the summary page shows how they relate to each other, how they can be used to build complete systems and the possibilities to use them with products from others. Besides products, the page has also architecture design examples. Our products are based on the knowledge we have about what works and what are the right building blocks for a successful design. Depending on the needs of the customer we can use our own products or choose something from the other vendors. Like the examples show, we do not always try to build everything from scratch, but take whatever works best for reaching the requirements. Our company does various things. We of course have our products, services and the R&D centered around them, but we have also our hobby projects -- the projects which we do because of their challenges and also because sometimes it is just fun. Tampere City Library's Internet Bus, Netti-Nysse, is one of those projects we are not just doing for money, but because it has its own challenges and it is fun to utilise our expertise to make the concept grow better. I am currently writing this sitting in the Netti-Nysse's lecture space somewhere near Venice and on route to Ljublana Slovenia. My mission here is to support the Netti-Nysse team in ICT issues such as the handling of the bus's central Linux server and getting Internet connectivity and bandwidth for the bus wherever and however we can. You might think that's an easy task, just add 3G HSPA modems, but the roaming costs of 1.5 EUR/MB do not exactly encourage utilising that kind of connectivity. So mostly it is just WiFi we already are and will be using. I have also a mission from Wireless Tampere to promote its open cooperative concept of wireless community network to Tampere's partner cities and at the same time I hope I will be able to find new cooperation, contacts, ideas and even roaming agreements between existing city-wide or municipial wireless networks. Arch Red Guest Server 2.6.1 has been released. The release includes one feature and many small enhancements. Now when creating guest accounts, the duration for the accounts can be set. What is duration? For example, a guest account is created so that it is valid until December 31st and has duration of 24 hours. The guest can log in any time before December 31st, and when the first login happens, the account is valid only for the next 24 hours. Duration could be specified in the previous versions too, but only for anonymous accounts. Now the duration is also available for personal accounts. See the demo page for more information about WWW and RADIUS demo. Both VMware Server versions, 1.0.x and 2.0.x, can be managed over ssh. Advantage of this is the simplicity of firewall rules which only have to allow ssh to enable VMware management - over ssh. Running VMware management over ssh is even more useful with VMware Server 2.0.x, which uses two TCP ports. debug1: Local forwarding listening on 127.0.0.1 port 1902.
ssh -v shows that all connections to local loopback address 127.0.0.1 and TCP port 1902 are forwarded over ssh to the server's loopback address 127.0.0.1 and port 902. The reason I am using port 1902 at the local end is that in order to use port 902 ssh must run as root. 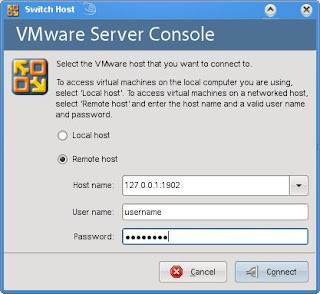 Connecting to the server with WMware Server Console is done by choosing "Remote host" and entering 127.0.0.1:1902 as "Host name". Remote port 1902 is not the default port on the server. The default port was changed with vmware-config.pl command from 902 to 1902. The port belongs to VMware authd process. The reason for configuring the authd port as 1902 is ssh. Now when the ssh command is run, there is no need to run it as root, since it does not have to bind to privileged port 902 but port 1902 instead. If the server has already been configured to use port 902 and reconfiguring is not an easy option, the ssh command can be run e.g., with sudo as root with port set to 902. Arch Red is now fully IPv6 connected. Web pages, email and DNS are most visible to everyone but also less used and internal services such as routing, RADIUS and centralized authentication run on IPv6 now. The latest addition was web availability over IPv6, so we can now consider ourselves as IPv6 enabled. Why now? Is now the time to start using IPv6? From the technical perspective IPv6 is mostly ready. Some applications and services such as VPN could still be more widely available. There is time to fix these problems, but the according to the projections, IPv4 addresses can only be distributed using the current policy for a relatively short time. For Arch Red's people IPv6 is something we have done for years. Since we consider IPv6 as one of our areas of competence, this is the right time for us. Based on our own experiences, it is of utmost importance to make your services ready before publishing them to others. Publishing usually means adding IPv6 information to DNS or by some other means advertising your IPv6 availability. This advice about readiness is almost a cliche. As the dictionary says: overused and has thus lost its original impact. Even if this is well known, IPv6 services often do not function as well as their IPv4 counterparts. There are many things that could be said about IPv6 but now is not the time anymore to roll out barely functional IPv6 services. There are already users out there and more and more are using IPv6 each day. Yesterday version 2.6 of Arch Red Guest Server was released. Along the new release, the demo was also updated and upgraded significantly. Besides WWW interface, the RADIUS interface is now available for connecting one's own RADIUS gear to see how the guest accounts work. The reason for bringing the RADIUS interface available is to have a way to demonstrate what is possible with Radiator. Serving basic authentication protocols, EAP for WPA and WPA2 and returning tags associated with guest accounts is just a small scratch on the surface, but should provide a good starting point. For example, all kinds of possibilities are available when utilising Guest Server's tag support. Thanks go to Karri for suggesting the RADIUS demo! PDF label printing is handy when using the Guest Server as an integrated customer registration and access control solution. PDF label size can be variable, they can contain your desired logo and any text you see required, such as reminder about acceptable use policy. The PDF label printing is also the first application of the new delivery framework, which offers a new interface for printing, mailing or using other methods such as SMS for delivering the account information to guests. Guest names and event titles can now be any language and be mailed or printed without problems with garbled fonts. It does not matter where your guests come from, be it northern Europe or Japan for example, names and event titles display correctly leading to better customer satisfaction. The user interface has been enchanced based on customer feedback. The workflow of adding guests is more streamlined and a number of other small enancements have been added. For administrators the new version offers more configuration options for controlling the guest account creation and enhanced installer. I will add more information and new demo showing the new version in a couple of days. Recently we had to resize a VMware virtual machine disk. The original disk allocated for the virtual machine was only 8 GiB when it was noticed 32 GiB would have been desired. Luckily the virtual disk can be expanded with the VMware web interface or using the command line tools. Also, the Linux file systems, at least ext3, can be resized, so it is possible to resize virtual machines without having to reinstall. A note of caution: What I describe belowed worked for me. I also took a backup from the virtual machine before doing any of the operations. There is no guarantee that this is the best, correct or even recommended way of doing the the resize. As one can see, the disk is now larger, but the Linux partition is still the same size as before resize. The next steps are to expand the partition and its file system. In this case since we are resizing the root partition, the operation can not be done from the host operating itself. One method is to boot a live CD that contains the necessary tools. For expanding the Linux partition and its file system, I decided to try GParted the Gnome Partition Editor which is conveniently available as a live CD. The main screen of GParted shows what the current configuration is. There is 8 GiB of allocated space for sda1 and 24 GiB space available for expansion. So did it work? Yes, just as expected. In a moment I will have a presentation in a TREX Internet exchange point's seminar about RADIUS roaming and the issues and proposed solutions -- both current and the future prospects. The presentation covers the path from simple RADIUS usage to a more complex RADIUS roaming situation today.